Danielle Simmen is obsessed with patterns and it's safe to say she always has been. 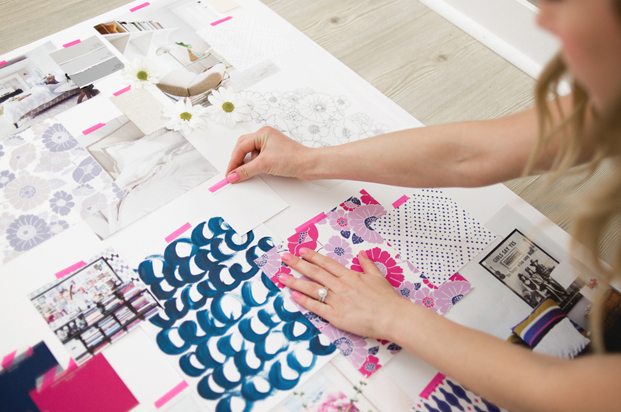 She believes that a good dose of pattern can make any space feel more special and complete. She studied textile design in Canada at OCAD U and England at Winchester School of Art, and then designed for the home decor industry for many years before creating Pepper B. in 2015 to spread the pattern love! The perfect denim pillow with a touch of texture. Insert not included. 100% cotton. Exposed Brass Zipper. Same fabric on both sides, fringe on front. Machine washable: Turn inside out and wash separately in cold water. Lay flat to dry.